Gru: I fly to the moon, I shrink the moon, I grab the moon, I sit on the toi-let what? Gru: Sorry. Sorry! Could you, uh, excuse me for just one second? What a year it has been for animated films. So far in 2010 we have had three great films from three rival studios. DreamWorks kicked things off with the surprise sleeper hit How to Train Your Dragon and animation juggernaut Pixar countered with the hotly anticipated Toy Story 3. 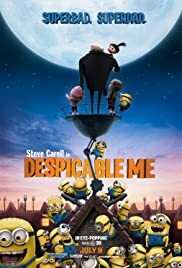 Now Universal's Illumination Entertainment has released the audaciously titled Despicable Me and while it may be the "worst" of the trio, it is certainly the most purely entertaining. The strengths of Despicable Me lie within veins commonly found in animated features, but his entry simply utilizes them extremely effectively. Along with jumping on the 3-D bandwagon (my theatre was screening it in normal dimensions) Despicable Me boasts an impressive voice cast, a ploy first used with Robin Williams way back in the days of traditional days of animation with Aladdin, superbly executed slapstick and what I will call the sidekick factor. Whether cute or wisecracking, you would be hard-pressed to find a film in this medium that does not employ this tactic. 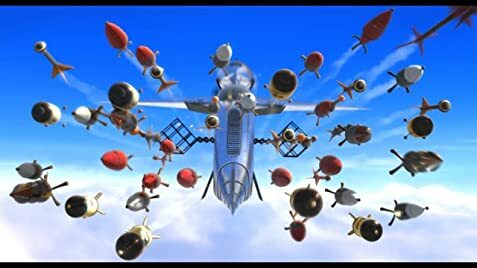 Even so called "art-house" animated pictures like WALL-E follow the trend (in fact, that particular film contains two such supporting characters) and Despicable Me ups the ante and adopts thousands. The villainous central character of Gru (voiced my Steve Carell) operates his evil lair with the aid of a multitude of adorable little yellow workers, and along with their "awwwee" factor, are the subject of a healthy portion of the aforementioned slapstick. Nestled in between the easy laughs however is ample heart and if you are prone to do so, you may very well shed a tear or two. This warmth is generated by three orphan girls, Margo, Edith and the doe-eyed Agnes, but perhaps I'm getting ahead of myself. All Gru has ever wanted is to be accepted, and what better way to achieve that goal than by resorting to supervillainy. After a fresh- faced rival villain Vector (Jason Segel) outdoes Gru by stealing a pyramid from Egypt, he devises a plan to obtain a shrink-ray from a government testing facility and use that technology to shrink, and then steal the moon. Things do not go according to plan after Vector steals the shrink-ray right out of Gru's spindly clutches. What's a supervillain to do? Devise another plan of course, this time using the three aforementioned orphans to infiltrate Vector's lair by selling cookies. It's all very complicated in writing but works very well on screen. Steve Carell does an admirable job in the lead voice role, and his Russian accent helps us to forget it is an A-list star nestled behind the animation. Russell Brand gives an unrecognizable performance as Dr. Nefario, the brains behind Gru's operation, and Kristen Wiig is hilarious as the head of the orphanage. The most disappointing is certainly the great Jason Segel whose underwritten character fails him as does his voice. Half of the allure of Segel is his physical presence and that is neutered in a voice-only role. 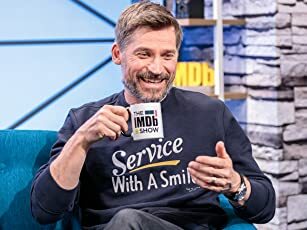 While the physical humour will no doubt please the kids, there is perhaps even more for adults and if a movie is able to make me double over in the isle, then it must be doing something right. With Shrek Forever After being the one misstep for this medium, I look enthusiastically forward to the remainder of the year. What I know for certain is I (and the audience I joined) had an absolute blast with this flick, that is despicable in name only. 53 of 79 people found this review helpful. Was this review helpful to you?